And OF COURSE a FREE TOTE BAG (see photo) is included! 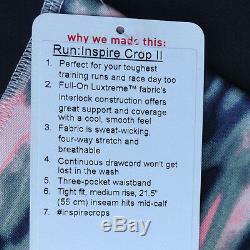 Item : Run: Inspire Crop II. 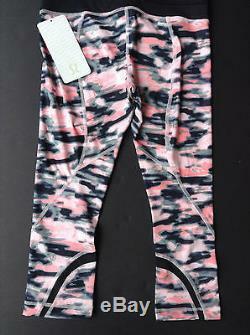 Material : Full-On Luxtreme (4-Way Stretch). LISTING NOTE : There is a slight variation in the pattern with each item in the W. Collection - the item pictured in this listing is the EXACT item you will receive! We offer YOU the choice!! (Translation: Dont Stress Out) : Our. 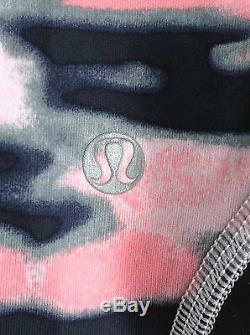 Return Period is more than TWICE the 2 week Return Period offered by Lululemon! We make no additional representation as to the fit of this item, if applicable. Due to different lighting conditions, display monitors, etc. Color may or may not be consistent with the attached pictures. Stating an item is Not As Described without providing details as evidence of such. 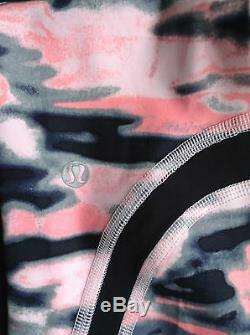 We are not affiliated with or licensed by Lululemon. FREE Tote bag may differ from the one pictured depending on availability. FREE Tote Bag is NOT included with Jacket orders e.
Define, Forme,, Scuba Hoodie, etc. MSRP is for reference purposes only. Item rarity and uniqueness (difficulty of acquisition), etc. 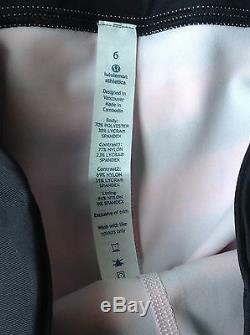 Hanger (if shown) is NOT included with this item/listing. 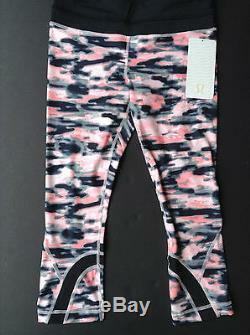 The item "NWT Lululemon RUN INSPIRE CROP II WAMO CAMO Black PINK Gray (Size 06) # 2" is in sale since Sunday, July 20, 2014. 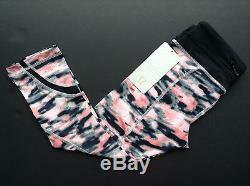 This item is in the category "Clothing, Shoes & Accessories\Women's Clothing\Activewear\Activewear Tops". The seller is "fashionconcierge" and is located in Atlanta, Georgia. This item can be shipped to United States, Canada, United Kingdom, Denmark, Romania, Slovakia, Bulgaria, Czech republic, Finland, Hungary, Latvia, Lithuania, Malta, Estonia, Australia, Greece, Portugal, Cyprus, Slovenia, Japan, China, Sweden, South Korea, Indonesia, Taiwan, South africa, Thailand, Belgium, France, Hong Kong, Ireland, Netherlands, Poland, Spain, Italy, Germany, Austria, Israel, Mexico, New Zealand, Philippines, Singapore, Switzerland, Norway, Saudi arabia, Ukraine, United arab emirates, Qatar, Kuwait, Bahrain, Croatia, Malaysia, Brazil, Chile, Colombia, Costa rica, Panama, Trinidad and tobago, Guatemala, Honduras, Jamaica, Antigua and barbuda, Aruba, Belize, Dominica, Grenada, Saint kitts and nevis, Saint lucia, Montserrat, Turks and caicos islands, Barbados, Bangladesh, Bermuda, Brunei darussalam, Bolivia, Ecuador, Egypt, French guiana, Guernsey, Gibraltar, Guadeloupe, Iceland, Jersey, Jordan, Cambodia, Cayman islands, Liechtenstein, Sri lanka, Luxembourg, Monaco, Macao, Martinique, Maldives, Nicaragua, Oman, Peru, Pakistan, Paraguay, Reunion, Bahamas, Viet nam, Uruguay.